Foreign Policy Magazine’s blog reported that in an awkward congressional hearing of the committee Thursday, Bonita Springs Republican Curt Clawson misidentified two senior U.S. government officials as representatives of the Indian government. Nisha Biswal and Arun Kumar are Americans who hold senior positions at the State Department and Commerce Department, respectively, the blog reported. 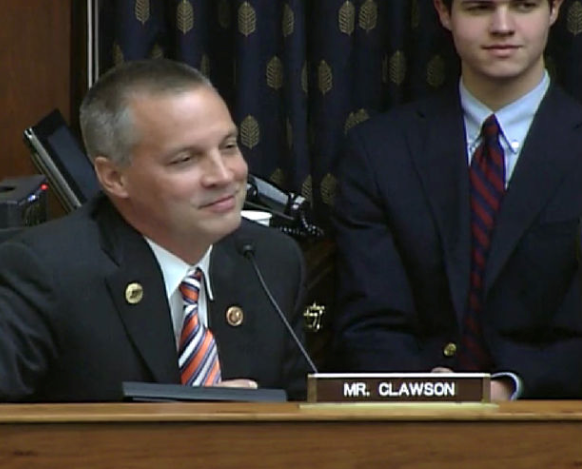 Here is a roundup of reaction to his comments.
.@ClawsonOutsider: "Just as your capital is welcome here to produce good-paying jobs in the U.S., I'd like our capital to be welcome there"
Nice to see Rep. Clawson (@clawsonoutsider) reenacting the diversity episode from The Office. I continue to be floored by the level of ignorance of our elected officials. How does someone this ignorant end up in Congress? Florida Rep. @ClawsonOutsider is either inept at his job or thinks all #POC are foreign. Maybe both. The people of #FL19 must be proud. What a maroon: "In an intensely awkward congressional hearing Thursday, freshman Rep. Curt Clawson misidentified two senior U.S government officials as representatives of the Indian government. The two officials, Nisha Biswal and Arun Kumar, are Americans who hold senior positions at the State Department and Commerce Department, respectively. Although both Biswal and Kumar were introduced as U.S. officials by the chairman of the Asia and Pacific subcommittee, Clawson repeatedly asked them questions about "your country" and "your government," in reference to the state of India. "I'm familiar with your country; I love your country," the Florida Republican said. "Anything I can do to make the relationship with India better, I'm willing and enthusiastic about doing so." I'm shocked @ClawsonOutsider didn't tell our U.S. gov't officials that he enjoyed Slumdog Millionaire in that exchange. @ClawsonOutsider Great job on improving the relationship with India. You really showed them whose boss.